On September 20 the legendary cutting stallion Metallic Cat sold in what is surely one – if not the – biggest sale transactions in the cutting horse industry. That afternoon, the star horse unloaded at his new home at Rocking P Ranch in Fort Worth, Texas. Alvin and Becky Fults, who owned and promoted Metallic Cat since he was a 3-year-old, officially sealed the deal with new owner Bobby Patton in negotiations brokered by Jeremy Barwick, owner of Western Bloodstock. With business interests in gas, oil, insurance and ranching, Patton is a partner of Guggenheim Baseball Management, which in April 2012 purchased the Los Angeles Dodgers. In 2015, Patton slid into a the sport of cutting when he bought leading cutting sire Boon San in Walton’s Rocking W Ranch Absolute Dispersal Sale. Then in 2016 he purchased Spots Hot, the 2004 NCHA Open Futurity Champion, earner of $529,435 and sire 2016 NCHA Open Futurity winner Second Spot. Indeed, Metallic Cat has set the big leagues on fire. With just four foal crops of show age, the 12-year-old stallion has already amassed $15,455,922 in offspring earnings, according to Robin Glen Pedigrees. No other cutting stallion has earned that much that fast. He was 2016 National Cutting Horse Association Sire of the Year, and at the end of that season stood at No. 13 on the list of all-time leading cutting sires. As for how the Fults came to own Metallic Cat, in 2008 they struck a deal to purchase the stallion, who was a 3-year-old at the time. This happened one year after Galyean used his truck as collateral to obtain a bank loan to buy the good-looking, red roan cutting prospect, which he found in a classified listing on the Internet. 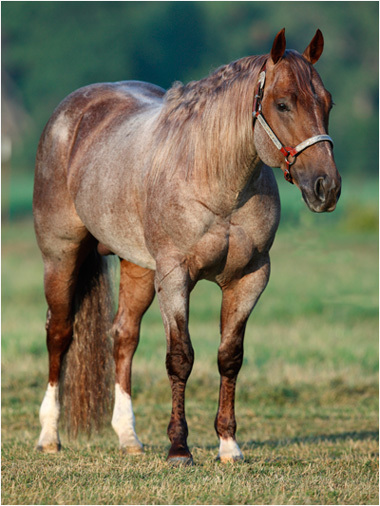 By High Brow Cat and out of Peptoboonsmal daughter Chers Shadow, Metallic Cat hit a home run at the 2008 NCHA Futurity when he and Galyean won the Open division and $250,000. Many victories followed and the stallion retired the same year with $637,711 in cutting earnings. Patton is looking forward to the arrival of his horse. Metallic Cat will live at Rocking P Ranch until the 2018 breeding season. That’s when he and Spots Hot go to Brazos Valley Stallion Station in Stephenville, Texas, an operation owned by Jeremy and Candace Barwick. Patton enjoys having his horses at home as much as possible, and he looks forward to what happens next. “I love the cutting industry and I like to ride the horses,” Patton said. “But I really enjoy the business aspect of cutting. I am intrigued by the economics of the stud business, and that’s what opened my eye to the possibility of owning a great stallion such as Metallic Cat. I’m confident that Metallic Cat is ultimately going to be the best sire in the cutting horse business, and I’m just so very grateful to have the opportunity to own him. Patton was thanked by the Fults, and added that he understood the gravity of their decision to sell the special stallion.